CHARLOTTE, N.C., September 28, 2018 – ​​No. 96 Xtreme Concepts Driver Jeffrey Earnhardt isn't just racing for the checkered flag this season. Over the next several Races, beginning with the Monster Energy NASCAR Cup Series Bank of America ROVAL 400, starting at 2 p.m. this Sunday, September 30, Earnhardt will also be joining Susan G. Komen®’s fight to save lives from breast cancer. The “Fueled By Hope” No. 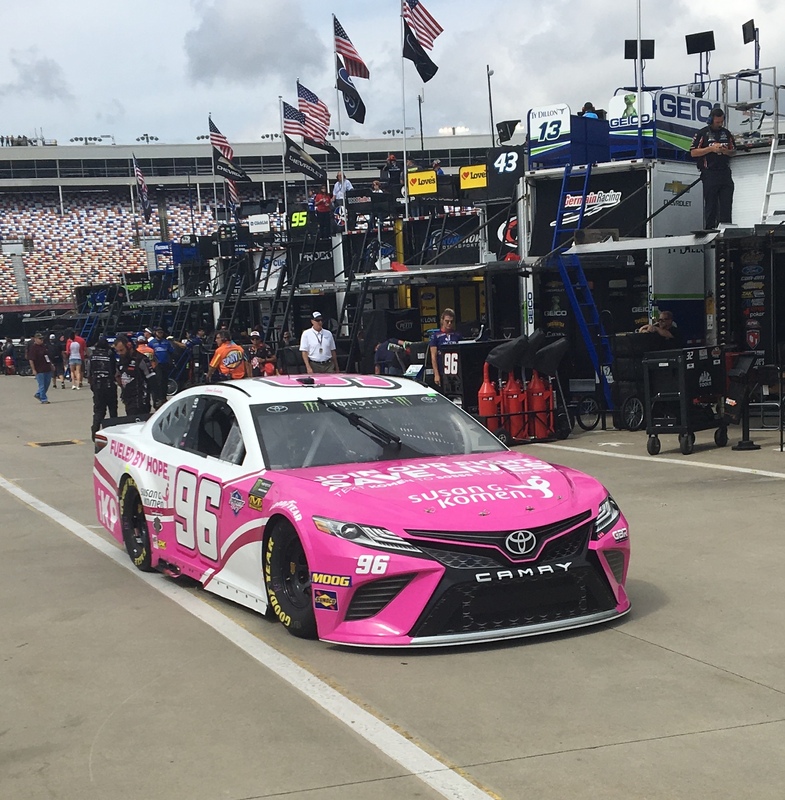 96 Toyota will definitely stand out in the field with its pink paint scheme, pink wheels, and clear challenge for everyone to text KOMEN to 50555 to help raise funds to support the world’s leader in breast cancer research and patient support. For Xtreme Concepts and iK9 CEO Landon Ash, it’s personal, as he lost both parents to cancer. The car is a tribute to his late mother Suzanne Bashinsky, who passed from breast cancer in June 2010. The car also provides an opportunity to help the millions of people currently affected by the disease and to help fund research to end breast cancer for future generations. It's an honor running a Susan G Komen car to support their fight against breast cancer, which affects so many people,” says Earnhardt. “It's awesome to help them in the fight for the cure. As a team, we want to show the same grit, hard work, and drive we have on the track in the important fight against breast cancer. We want to do all we can to make a difference in this battle, and I can't wait to run this unique design in #96 this weekend. More than 250,000 women in the U.S. are estimated to be initially diagnosed with breast cancer this year alone. While rare, breast cancer can occur in men, as well, with an estimated 2,550 new cases this year. The entire Gaunt Brothers Racing Team, Xtreme Concepts and iK9 crews will be supporting Komen and the people and families it supports throughout the weekend, including appearances, fan engagement, Facebook Live events, and other promotions. Xtreme Concepts Incorporated (www.xtremeconcepts.com), based in Birmingham, Alabama, is a worldwide leader in providing turnkey security solutions, special operations training and technology integration to Government agencies, Department of Defense and commercial entities on a global scale. Its sister company, iK9, LLC (www.iK9.com), is a comprehensive Canine Solutions provider for detection and service dogs, along with professional handler education. Susan G. Komen is the world’s largest breast cancer organization, funding more breast cancer research than any other nonprofit outside of the federal government while providing real-time help to those facing the disease. Komen has set a Bold Goal to reduce the current number of breast cancer deaths by 50 percent in the U.S. by 2026. Since its founding in 1982, Komen has funded more than $988 million in breakthrough research and provided more than $2.2 billion in funding to screening, education, treatment and psychosocial support programs serving millions of people in more than 60 countries worldwide. Komen was founded by Nancy G. Brinker, who promised her sister, Susan G. Komen, that she would end the disease that claimed Suzy’s life. That promise has become Komen’s promise to all people facing breast cancer. Visit komen.org or call 1-877 GO KOMEN. Connect with us on social at ww5.komen.org/social.